China has opened up its domestic sat-nav network to commercial use across the Asia-Pacific region. Beidou - named after the Chinese word for the Big Dipper constellation - offers an alternative to the US's global positioning system (GPS). It had previously been restricted to the Chinese military and government. A spokesman said that Beidou is targeting a 70-80% share of the Chinese market in related location services by 2020. 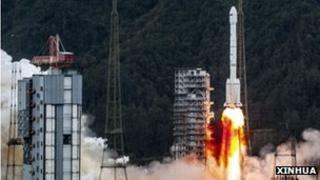 The China Satellite Navigation Office added that by that time it also intended the service to be available across the globe. Chinese officials say that Beidou can identify a user's location to 10m (33ft), their velocity to within 0.2 metres per second, and clock synchronisation signals to within 50 nanoseconds. At present the receiver chips cost several times more than their GPS equivalents. However - assuming prices fall - the Chinese government believes manufacturers will want to build them into equipment alongside those made for the US system, to offer users improved coverage. Six satellites are already in orbit, but officials said they planned to add a further 40 to the system over the next decade, according to a report by China Daily. Organisers have estimated that the market for transport, weather, and telecom spin-off services from Beidou's signals could be worth 200bn yuan ($32bn; £20bn) by 2015. The country recently showed off domestically-built drone aircraft at the China International Aviation and Aerospace Exhibition, which would be reliant on such location data to operate. Beidou is one of a growing number of alternatives to GPS under development. Russia is developing the Glonass system for both civilian and military use. It has 23 operational satellites in orbit. However, a recent report by Russia Today suggested the country's defence ministry had reservations about the project after a corruption scandal and technical problems. The EU is also working on its own network - Galileo. It began sending test signals from its third satellite at the beginning of the month - a minimum of four are necessary to lock onto a location. Meanwhile, UK defence company BAE Systems is working on Navsop - a system that relies on hundreds of existing signals including those used for radio, TV, wi-fi and mobile phones. It suggests that when completed the system could offer "superior performance" to more expensive dedicated navigation satellite networks. However, it has not announced a launch date.